Note: This article covers our older legacy Smart Forms. For modern, mobile responsive ONTRAforms please see our articles on ONTRAforms and ONTRApages. ONTRAPORT allows you to create very sophisticated web forms that you can quickly add to your website. What makes our forms ‘smart’ is that they can be set up to add items such as Tags to the contact as soon as he or she clicks submit or even drop them right into your predesigned marketing sequences, fire rules based on field fill-outs, send them to a designated thank you page based on field fill-outs, show/hide fields based on field fill-outs, or route them to someone on your team of salespeople, automatically. Forms are essential in capturing contact info from your web visitors that will allow you to keep in touch with them over time. The most common use for SmartForms is to give people a way to opt-in for more information from you, but there are many more uses. Required Checkbox: Checking this checkbox means that your contacts must fill out the selected field before submitting it. We recommend checking the required checkbox on the email address field and first name field. Field Label: This is the name of the field as it appears on the form. The field name will appear as it was created in your database, but the SmartForm will appear as listed in the Field Label section. Place your fields in the order you’d like them by clicking and dragging them into your desired location. Field Style Basics: After clicking on a field, the ‘Form Style’ tab is where you can style your form to your heart’s content. This is much like any word processing toolbar that allows you to adjust font type, size, color, etc. The information below includes the basics! Font Family: This adjusts the type of font used on your field labels. Font Size: This adjusts the size of the font. Font Color: This adjusts the field label color. Use the slidebar on the right to select a color range and the small circle to adjust exact color. You can also enter hex colors in the text box. Text Style: This adjusts the style of the field labels including bold, italic, and underline. 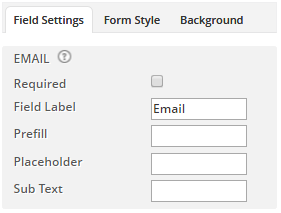 Click the Background tab to modify the background of your form. Click the Background tab to modify the background of your form and select your desired look from the Border Style pulldown menu. Adjust Form Size: You can adjust the width of your form by using the left/right arrows to the right of your form. Background Color: This section allows you to modify the background. Border Transparent or Color: This section allows you to add/remove a border around your form. 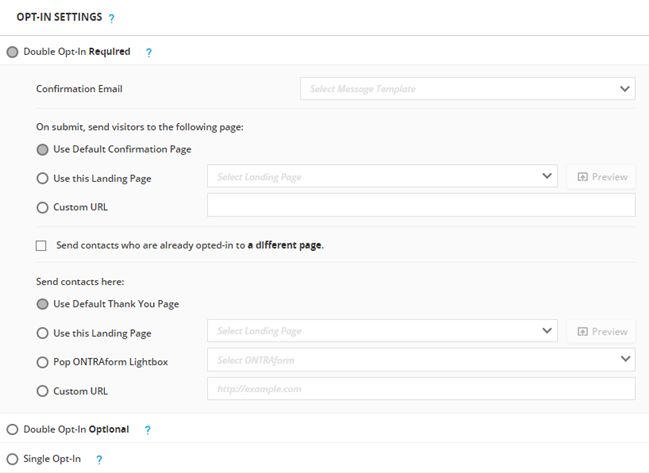 This section handles all the backend operations and the ‘automagic’ of your smart form including your opt-in settings, thank you page, tags, sequences, rules, and form fill out notifications. To navigate to it, click the Settings Tab. Opt-In: We have three opt-in settings available – Double Opt-In Required, Double Opt-In Optional and Single. Select the radio button on the option you’d prefer. Thank You Page: This is the page that contacts will see after they fill out the form. You can use our default thank you page, a landing page you’ve built in our landing pages editor or your own custom URL that you’ve created on your website. Manage Form Fills: This section allows you to customize what Campaigns, Tags or Sequences are added by the form itself. Every form submission, even failed Order Form transactions will add these Campaigns, Tags and Sequences. See the section on Conditional Rules to add Tags or Sequences only on a successful payment. It is strongly recommended to use Campaigns for all of your automation, and to leave these sections blank. If your Campaign, Tag or Sequence is already created, click the + Add button and select it. You can also create new Campaigns, Tags and Sequences from this interface. Always On Rules: You can create rules that are triggered when a contact fills out your smart form, enabling you to run sophisticated actions on contacts as they come in through your forms. Click the +Add Rule button, name the rule, add conditions and what should happen. Learn all about rules here. Conditional Rules: The Smart Form Always On Rules section becomes the Conditional Rules section if you add a product to sell to the form. This allows you to fine tune the response based on the result of the charge attempt. See Creating an Order Form for more information. Notification: If you’d like to be notified by email every time a contact fills out your smart form, insert your email address in the text box. Routing: Select who on your team should be the contact owner of any new contacts filling out this form. You may also choose to add new contacts to a lead router. Now that your form is created, styled, and set you’re ready to test and publish! The Publish button gives you multiple options when it comes to placing your form online. 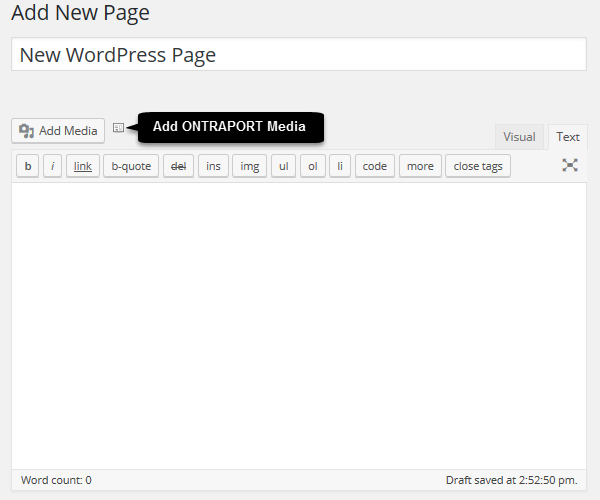 If you are using an integrated WordPress site with the PilotPress plugin installed, you can select your Smart Form from the Add ONTRAPORT Media button. Seee WordPress Integration Overview for more information. Field Settings allow you to change the settings for a single field. Click a new field within your canvas area to reveal the field settings. Required - Require an entry in this field. Field Label - What your contact sees for the field label, such as "Enter your First Name"
Prefill - Default text for the field; your contact can change it or leave it to be entered into their Contact Record. Placeholder - Similar to prefill but it disappears when users click on the field or submit the form. Padding - See spacing and padding key. Page Background (for hosted items) - This area contains the same settings as the above background settings for forms that will be hosted on their own page with ONTRAPORT. Add Content - Add content (images, text, tables, code) to your form. 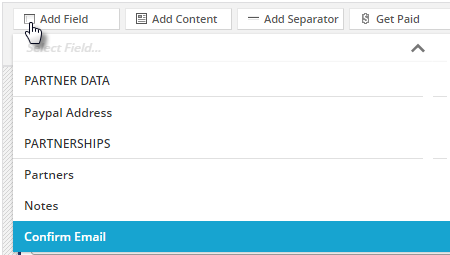 Add Separator - Add a separation line between sections of your form. Get Paid - Add an ONTRAPORT Partner link image to your form. Sell Products - Turn your Smart Form into a customizable order form. Add your product(s) and tweak the shipping, payment method, payment options, tax, invoice, and design settings. Conditions - Add conditions to your forms (see Form Conditions for more information). reCAPTCHA - Add reCAPTCHA to your form. See directions below. reCAPTCHA uses a single mouse click to confirm the visitor to the page is not an automated "bot" and helps prevent spam submissions. Note: The original Captcha on Smart Forms has been discontinued. ONTRAPORT has disabled the older Captcha in order to allow your forms to continue processing opt ins and orders. To replace the old Captcha with this new version please edit your forms and follow the instructions below to add a new reCAPTCHA to the forms. You can return to add additional domains later. Check the box next to Accept the reCAPTCHA Terms of Service and Send alerts to owners, and click Register. Copy the Site Key and Secret Key to a text file for use later in ONTRAPORT. In ONTRAPORT, click the profile icon at the top right and select Administration. Click on the Security tab and the reCAPTCHA Settings. Enter the Site Key and Secret Key numbers from reCAPTCHA in the appropriate spots, and click Save. The Manage Form Fills and Always On Rules sections are where you customize what tags, sequences, and rules get applied to a contact when they come through your form. We recommend you use a Campaign with a Trigger for "Fills Out Form" instead of these sections. These settings are rarely used, but are provided for advanced form handling. Whenever someone fills out one of your forms, opens up one of your emails, or visits one of your PURL pages, we automatically place a special tracking cookie onto their browser that identifies them so when they visit your site in the future (provided your site has our tracking scripts on it). This is precisely how we're able to provide all the great site-visit tracking information for you in the contact log area of your contacts' records. In most cases, when someone fills out one of your forms, our software looks at their email address to decide whether they're a new contact or if they already exist in your database. If the email address matches one of your existing contact records, then the new info is simply merged in with the existing record for this contact. If not, they're treated as a new contact and a brand new contact record gets created for them. However, when you check the 'Override Email Address Merge with Cookie Data' checkbox, it makes it so that if we already know who the contact is based on their cookie data, then regardless of what they put as their email address - or even if they don't input one at all - we still update the contact record for that contact. You want to use a SmartForm in order to allow your current contacts to update their existing contact info on a form where you don't want to have (or require) email address. You want to use two or more forms strung together, one after the other to gather progressively more information, where only the first form in the series requires email address. In this case, you wouldn't check the 'override email merge' box on the first form but would on all subsequent forms. That way, the new record will be created (and the cookie will be set) on the first form, and all additional data gathered from subsequent forms will be added to that contact's record. This is an advanced feature that takes the data input into form fields and puts it in the URL of the Thank You page so that it can be used by other scripts. If you don’t understand this, ignore it. It’s for geeks. This option delays displaying the Thank You page until all immediate steps in a Campaign or Sequence added via the Manage Form Fills dialog is completed. This can make the form appear to process more slowly, and is not recommended. Smart Forms use IP geolocation to determine city, state and zip code for new contacts who haven’t filled out location details. Note: this will only take affect if these fields were not manually entered by the contact on the Smart Form. If you would like this feature turned off, just contact our support team. Three options are available via the links on the left, I will install my Form, Send to my webmaster and Host my Form. Select from the following types of code we supply to place a form on your website. Provides a code snippet that generates a link. When the link is clicked, the form pops up in the center of the window. You can edit the text for the link, or substitute an HTML image tag to use an image as the link. Changes made in ONTRAPORT will automatically be reflected on your website without having to copy and paste the form again. IFrame code is the most robust, and should be used if your website experiences jQuery conflicts with ONTRAPORT forms. 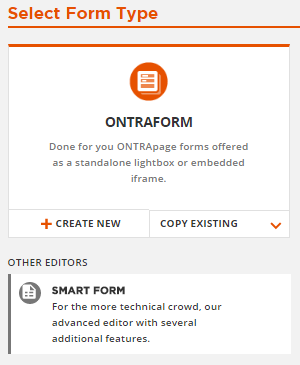 Changes made in ONTRAPORT will automatically be reflected on your website without having to copy and paste the form again. If you want to change the HTML/CSS of the form use this version. Please be cautious when changing this code, and be mindful that we cannot support custom coded forms. If you change the form, you must copy and paste the form code on your website again. This option makes ONTRAPORT host the form on its own page. The link to the hosted page is given to you upon selecting this option. For order forms, remember to change the "http:" to "https:" to serve the page from our secure servers. Q. I want all my contacts to verify their email address on my forms. Can I do that? A. Yes, add the Confirm Email field to your form. Q. I had the old Captcha on my forms, and it's gone now. What's up with that? A. Google disabled the old Captcha in January 2018. To keep your forms working, we disabled the function on all custom domains. 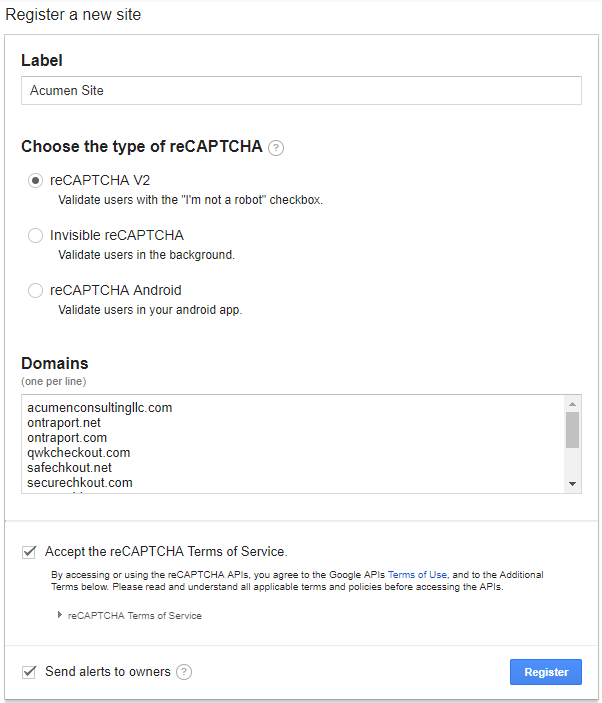 This article has information on adding the new reCAPTCHA to your legacy Smart Forms listed above. For more specific information, please see this Community Q&A Article.